You may have found a lot of stone carving crafts in China and some other oriental countries, but hardly have you ever seen any rubber crafts. Why so? There are historical and traditional reasons. The first use of stone can be traced back to thousands of years ago, when ancient Chinese made stone weapons to fight against wild animals and stone containers to hold food. Later, it became an ideal material for crafting. Stone carved animals such as stone lions almost became symbols of historic sites in China. You might be surprised to know that rubber was introduced to China as late as in the early 1900s. Considering an existing history of less than a hundred years, it’s understandable that rubber crafts are almost ignored by Chinese craftsmen. 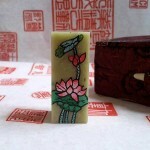 Rubber stamping is one of the most popular rubber crafts. If you key in the words like “rubber stamp”, “rubber stamping” or “custom rubber stamp” on internet, lots of web pages will pop up. You may be disappointed though that few of the results are from China, Japan or Korea. What if you some try other terms, such as “Chinese seal”, “name chop” or “Japanese hanko”? Right, stamps have different names in the Orient! 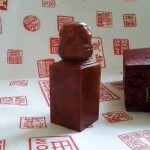 Chinese seals are mostly carved from stone due to the deeply-rooted stone carving tradition in China. 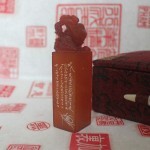 Compared with rubber stamps, Chinese seals are used on more formal occasions for contracts or official documents. The quality and value of seals are subject to the kind of stone used as well as the workmanship, yet the most important attribute of rubber stamps eventually lies in the design.